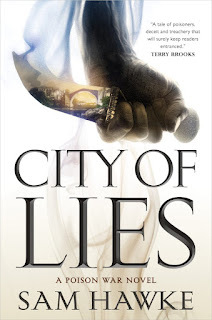 City of Lies starts a new city-state focused epic fantasy with a pair of sibling protagonists wrestling with not only the coming of age of their abilities and responsibilities, but a threat to their world and conception thereof. Jovan and Kalina are young siblings in the city-state of Silasta. Both siblings are far more than they appear. Kalina suffers from a physical disability that causes everyone to underestimate and discount her, despite her determined, willful side. Jovan is non-descript, forgettable, and since the age of seven, been in training to detect and employ poisons on behalf of the family of the Chancellor.When an assassination of the Chancellor coincides with a sudden and surprising siege of their home city, Jovan and Kalina are going to have to grow up if they, and their home, are going to survive. Welcome to the world of debut author Sam Hawke’s City of Lies. The rich world of Silastra, its environs, history, and culture are a strongly envisioned and conveyed world to the reader. This starts with the format of the text. Interspesed between the chapters are descriptions of various imaginary poisons, where they come from, what they do, how a proofer like Jovan might detect and stop them. This conceit really helps with the illusion that the author has thought of every single detail in her imaginary world, and the entries were a highlight of my reading. When a new chapter started, I was always eager for another morsel of the world conveyed thereby. Too, the world of Silastra. The city-state, sitting on trade routes and rich and powerful, made me think of Italianate city-states, with its class stratification, scheming nobles, and it’s relations with often much larger neighbors. Rather than being a maritime power like the Renaissance Italianate city states, Silastra is landlocked, but given it is astride the shortest and best trade routes across the landscape, it has a power and reach that allows it to punch above its weight. This makes for all the more contrast when a besieging army shows up at the walls, Silastra’s army inconveniently (for them) away from the scene. Showing a potent power humbled, and suddenly scrambling when the chips are down and finding out what they are made of gives us a good idea of what the city really is like when the chips are down. So, too, the protagonists. Putting her protagonists under pressure is a way for the author show the true quality of Jovan and Kalina, both imperfect, flawed and striving young people who are trying to transcend their limitations. The sibilings play well against and with each other and seeing how the siblings see each other and how they individually see the world. The novel’s format is of alternating chapters, each alternating the point of view from one sibling to another, in an intimate first person point of view that gives us lots of internal thought and feeling that makes us sympathize and really get to know them. Jovan’s inexperience and the pressure of suddenly being a proofer for the new Chancellor, his best friend, is an immense responsibility for someone whose training is not complete. Kalina, by contrast, whose disability has long since washed her out of becoming a proofer, has an even more fraught path, and one without a clear future that she must try and find and forge for herself, in the middle of the chaos surrounding the city. In the offing, we learn lots about Jovan and Kalina, and also enfold in even more worldbuilding in the doing. If you want to read a novel where we go deep into the lives of young minor nobility in a fantasy city state under threat, City of Lies is the novel for you. The novel has room and space to explore some interesting themes, even as we have our protagonists dealing with their home under siege, a slowly constricting situation that gets ratcheted worse and worse as the novel progresses. There are strong themes of responsibility, sacrifice, duty and stepping up to a challenge, true. I was expecting those, and those themes are well explored. But there is an even richer backstory of history, of subjugation, of lost culture, of appropriation, of colonialism and a lot of fraught subjects that get exploration as well. Silastra, as it turns out, as a surprise to our protagonists, is not the shining city that it first appears.The title of the novel as premise and promise is fulfilled. My major issues with the book really come off at the end matter of the book. Throughout the book, we’ve slowly gotten to learn more about the setup, what is really going on (even as the main characters themselves do).The ending chapters though, don’t quite live up to the first 3/4 of the book. Kalina’s POVs chapters at one point turns almost perfunctory and not quite as sharp as Jovan’s. There are plot-related reasons that explain some of it, but I felt that the novel really wanted to tell much more of Jovan’s story than Kalina’s, and so a “two hander” of a point of view gets unbalanced. There is also a distinct sense that the author pulls some of her punches in the denouement. Also, the book, with such a grounded and localized sense of setting, and the layout of the city under siege being rather crucial to the plot, the book really could use a map of the city-state. I do hope that there will be subsequent books set in this world. The questions that the book answers by the end really are just the beginning of the questions I have about the world. In addition, Jovan only really comes into his own by the end of the book, and I am looking forward to seeing where his character development can go in subsequent books.